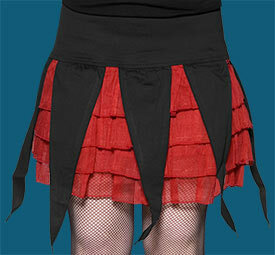 This spunky skirt features four layers of red ruffles with black fabric at the waist and pointed black strips over the red! Length is 16". 100% cotton. Waist measurements are as follows: Small/Medium=28", Medium/Large=30"